Baby’s skin is very sensitive, especially during the first six months. For the first six months you may notice many changes in the baby skin. Babies may have rashes, acne or red spots and many other skin problems. These may or may not go with time, if they go then it’s good and if they don’t go then you need to consult your doctor. 1. Choose a good diaper: Baby skin is very sensitive and a baby wears a diaper for a very long time. While wearing a diaper you baby may pee or pass stool which may remain in the diaper for a long time and it can cause reddishness or react with the baby skin if not cleaned in time. A good diaper protects your baby skin by maintaining the pH level. Soft materials/fabrics: The material and fabric is specially chosen with delicate little bottoms in mind. This makes the pants the softest for babies. 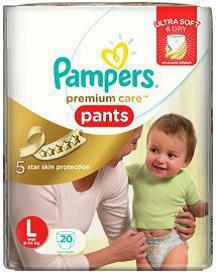 Up to 12 hours of dryness: Pampers core quickly absorbs helping keep wetness away from the skin to help skin protection. This lets the baby sleep the whole night comfortably. Baby lotion: A drop of lotion to help protect your baby’s precious skin and maintain a balanced level of pH for your baby’s skin. Wetness Indicator: It turns from yellow to blue when in contact with fluid to help parents know when it needs to be changed. 2. Washing Clothes: Babies clothes must be washed in a good liquid cleaner so that any germs or bacteria on clothes are washed off. Improper washing of clothes may cause reddishness or allergy on the baby skin so make sure to wash the baby clothes with a good liquid cleanser. 3. Good Soap: A good soap should be used on your baby skin. Soaps with pH 5.5 are available in market which do not harm your baby skin. They keep the pH level of your baby’s skin balanced. 4. Good Moisturizing Lotion: A good lotion protects your baby skin from dryness and keeps it healthy. A good moisturizing lotion keeps your baby’s soft skin safe. 5. Avoid Talcum Powder Initially: During the initial months of your baby Talcum Powder should be avoided as it may or may not cause harm to your baby skin. Apart from it, it can baby may inhale the small grains of powder and it may cause lung problems. So, talcum powder should be avoided.